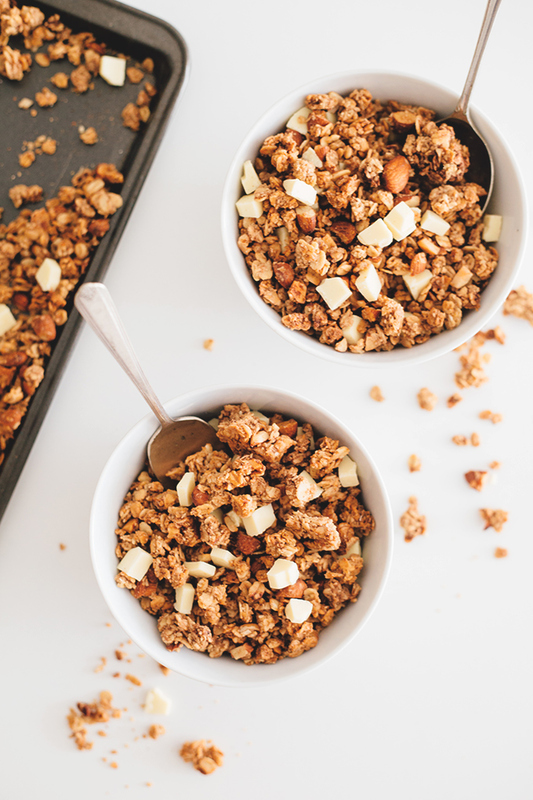 Last year, if you remember or pay any attention to my blog at all (which you probably don’t, and I don’t blame you) I went on a bit of a Granola making frenzy with my Vanilla Almond Granola and Chocolate Hazelnut Granola. Safe to say, I stuffed myself with so much Vegan Granola that I couldn’t look at Granola again for a good 6 months…and 6 months is all it lasted because here I am, back on the Granola train again. 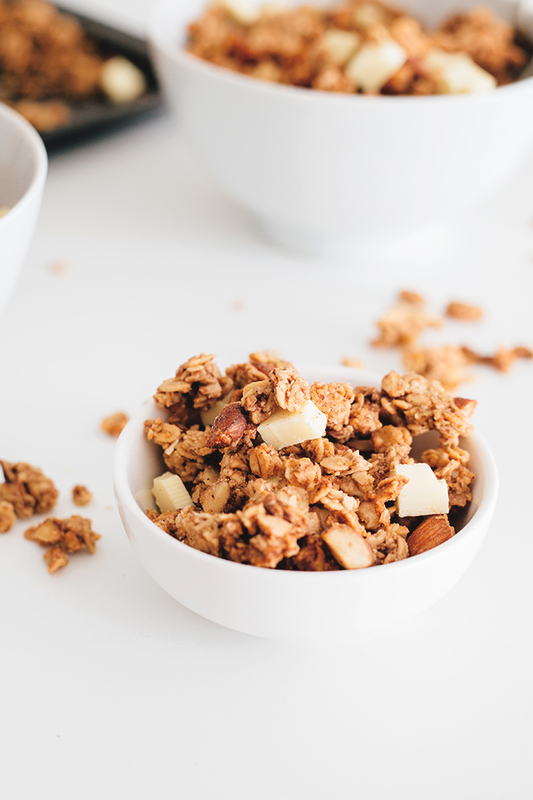 This time round, I’m sharing my recipe for my Vegan Chai Spiced Granola that is perfect for breakfast or as a snack. 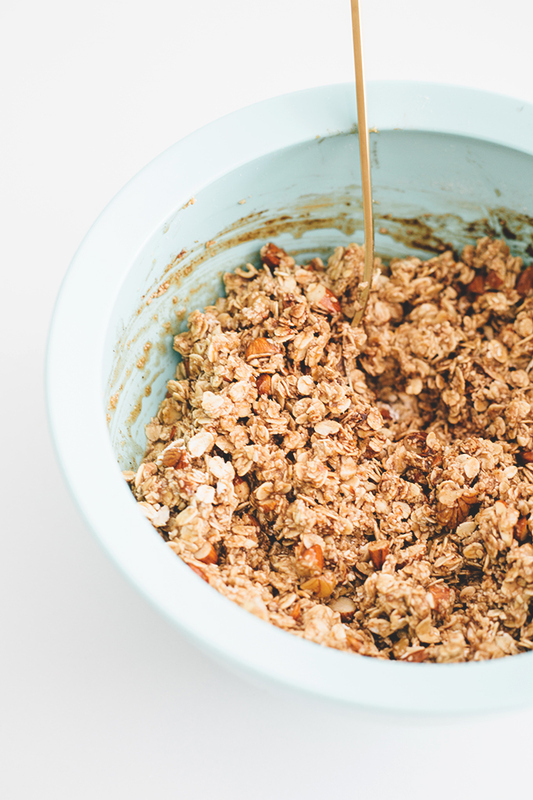 Sure, you can go out and purchase a box of Granola in 2 minutes, but why not make it yourself? I personally love making everything myself because I like to con myself into believing I am a Domestic Goddess. I’m more like a Domestic Nightmare in reality. 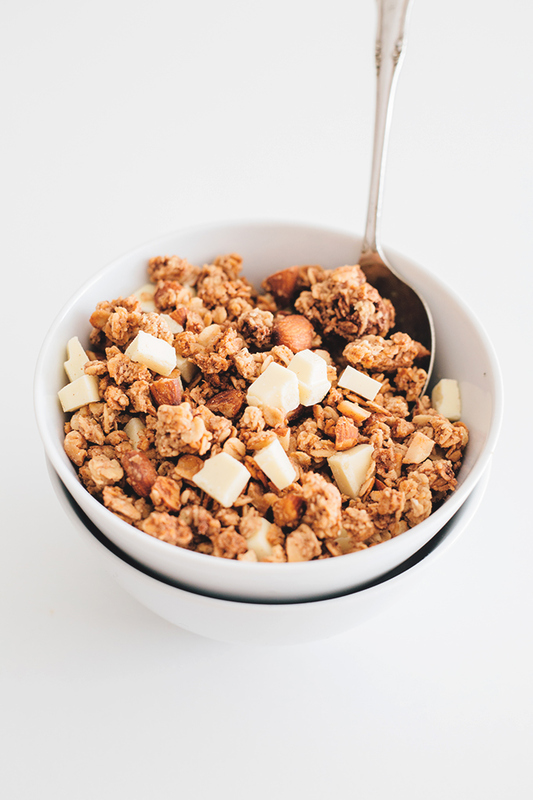 Chai Tea Lattes are my ultimate favourite drink to sip on in the mornings, so I thought to myself, why not combine my morning Chai with Granola? I am a naturally lazy person, so if I can combine breakfast and tea into one easy bowl, I’m all for it. Thus, my Vegan Chai Spiced Granola was born! I start off with my basic Vanilla Almond Granola recipe, and to said recipe, I add Ground Cinnamon, Ground Cardamom, Ground Ginger, Allspice, Ground Black Pepper and Vanilla Bean. Trust me you guys, the smell that wafts out of the oven is INSANE. Once my Chai Spiced Granola is baked, I let it cool down thoroughly and then add chunks of Vegan White Chocolate to it for thad added “milky” factor that is so synonymous with a Chai Tea Latte. The final product with this simple Vegan Granola recipe is something that is not too sweet, easy, healthy, beautifully spiced, full of mouthgasmic clumps and dangerous to have around the pantry because I just have no self control when it comes to snacking. I have not tested my Granola recipes with Gluten Free Oats, but feel free to try if you’re Gluten Intolerant. Anyway, scroll down for the full recipe, put your Granola making pants on and go forth and create some delicious Vegan Chai Spiced Granola. 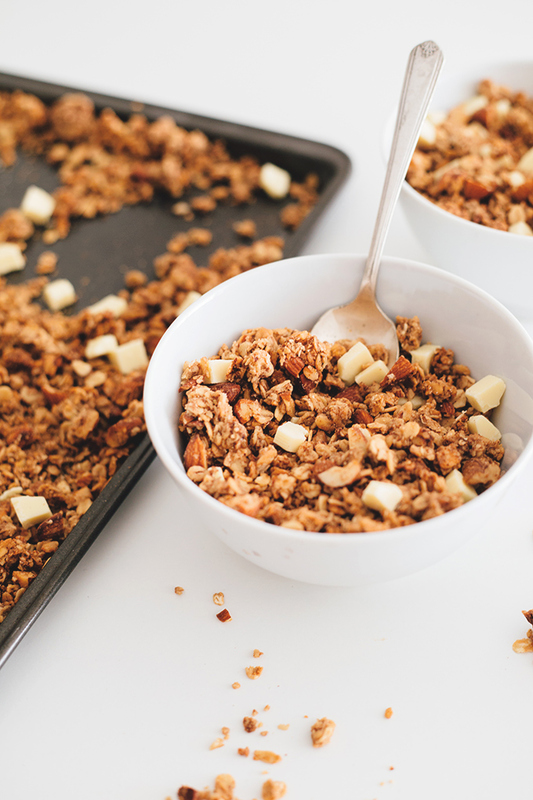 Delicious Vegan Chai Spiced Granola, a Healthy and Delicious Morning Cereal Treat. Preheat oven to 160 celsius and have a cookie sheet on hand. Process 2 1/4 cups of your Rolled Oats in a food processor till you end up with Oat Flour. 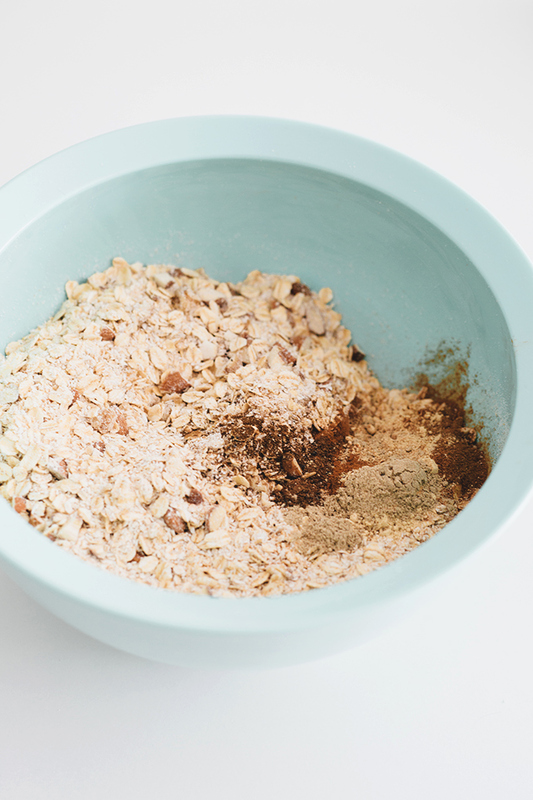 Mix oat flour with Rolled Oats and Chopped Almonds. Add Ground Cinnamon, Cardamom, Cloves, Black Pepper and Allspice to your oat mixture. Set aside. In a small saucepan, combine Maple Syrup, Brown Sugar, Sea Salt, Vanilla Beans, Oil and Water. Bring to a boil, take off the heat and pour onto Oat mixture. 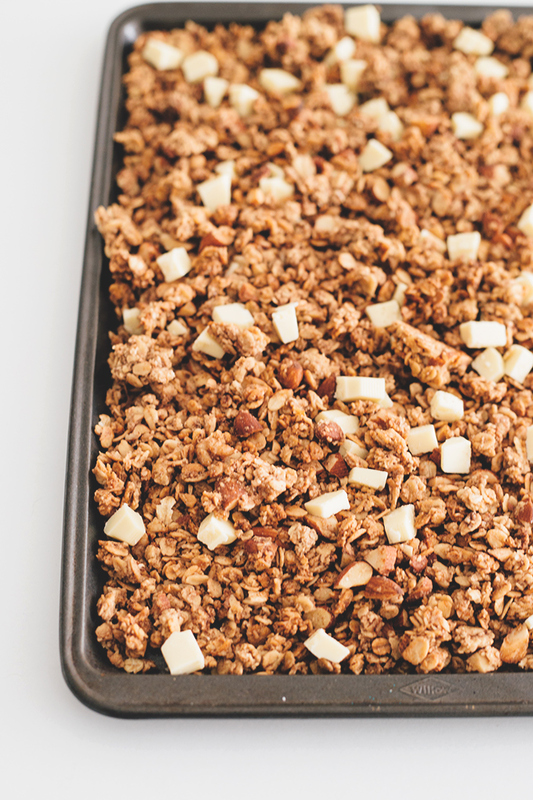 Stir well till all of your oats and nuts are coated with the mixture and spread out on baking tray in a single layer. Bake for 30 minutes, and then stir mixture. Bake for another 30 minutes. Once baked, removed from oven and let cool thoroughly. Once cooled, stir in White Chocolate. Thanks a lot Amrita I made this granola and now have been basically handcuffed to my kitchen stool for the last 24 hours while I wolf it down. Supposed to go out tomorrow don’t think I’ll be wearing that dress..